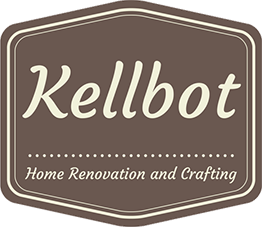 Ordering Cabinets, Appliances, and Picking Backsplash Colors - Kellbot! | Kellbot! On Tuesday I went to Ikea before work to order cabinets. I wanted to go in the morning during the week because I know that with the current sale the place is a total zoo on the weekends. I also was warned that ordering Ikea cabinets is not a fast process, and to allow about an hour. Unfortunately it took more like three. The downside of getting there early was that I got there before the manager of the kitchen area. There was a sales associate there to help me, but he was new and couldn’t handle some of the more complicated aspects of my order. I didn’t want any doors (we’re getting them made in solid wood by Scherr’s instead), I wanted to order custom quartz countertops, and I needed them to calculate the undercabinet lighting stuff for me. New Guy helped me as best he could but ultimately Mr Manager had to come and redo most of it when he got in. Aside from the new guy drama, ordering cabinets is just really fiddly and seemingly lacking optimization. First you bring up your design from the 3D planning software. Then they import the design into their sales order software. Then they go through every single cabinet in the order to make sure everything is correct. Along the way they fix any inconsistencies (I had accidentally selected one off-white panel to go with my white panels, for example) and account for any design oversights you may have made. For whatever reason some things like lighting can’t be added in the 3D design software and must be hand-added by staff. The quartz counter tops are handled by a 3rd party vendor, so that’s an entirely separate process. The sales associate has to calculate all the rough dimensions and edgings of your counter top in order to give you a quote. It just all takes a while. There are a few design tweaks since the last revision: we ended up going with a narrower fridge, and I reconfigured some things to the left of the range, so now I don’t have to do any major surgery on the cabinets. I’m still making a custom shelf for the end of the upper cabinets, but no other hacking is needed. I ordered the fridge and range from a local appliance place. They were the same price or better than Home Depot / Lowes for the same models. The Sears outlet had a really good price on a scratch + dent dishwasher so I’m going to try to get out there this weekend to see it. Everything is slowly coming together. 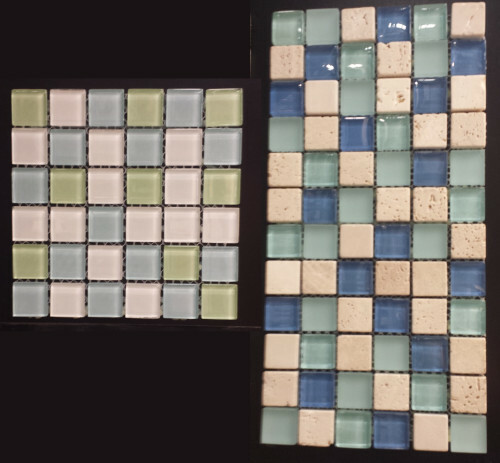 I started looking at backsplash tile today while I was in Lowes. 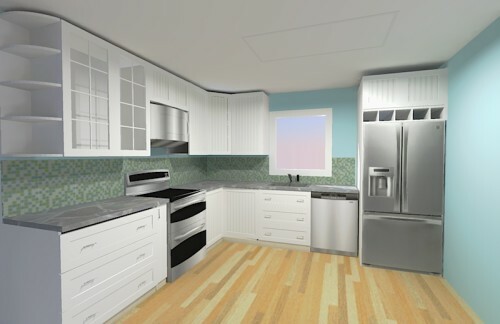 Two choices that looked really cute in the store look really overwhelming when I mocked them up in SketchUp. 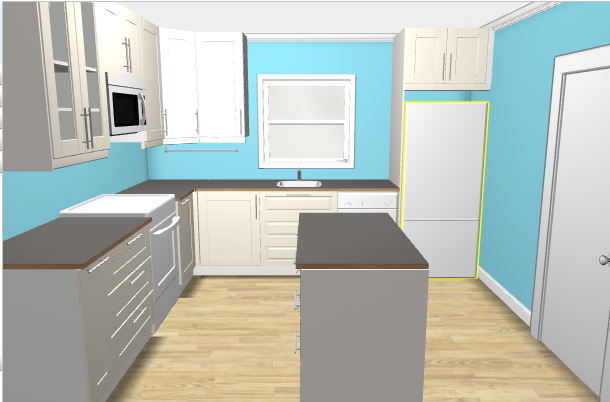 In SketchUp they look kind of like a train wreck and I don’t know if it’s just because the colors aren’t real-to-life accurate, or if it really would look this busy. The green one looks SUPER GREEN in the mockup, which is not what I was going for at all. Mercifully the backsplash is one of the last steps so I have a while to think about it. But omg, so many steps to this process. We’re going down this weekend to hopefully finish ripping out the soffit, and maaaaaaybe take out the hot water heater and start working on the subfloor repairs. Oh and paint prep. There is always more paint prep to do. That kitchen is going to look great. I have been wondering — do you have someone watch Leona while you do all of this? Since we’re in the market for a house that will likely need work, I am trying to imagine how to do it without Wes around. Yes, my in-laws watch her a lot. Other times I go down by myself (or with my dad) and Chris stays home with Leona. Last week I did a day trip and didn’t make it back in time for daycare pickup. Chris was going to take a zipcar when he realized that I still have the car seat… so he ran there with a jogging stroller and jogged home with her (about 3 miles each way). Also Tasha if task rabbit etc is active in your area i had people come help me out cheap – perhaps you and mike can take turns with Wes and have a task rabbiter (or equiv) help out? Yes to those. I dig the smaller ones, and I think the blue-er ones would look good. 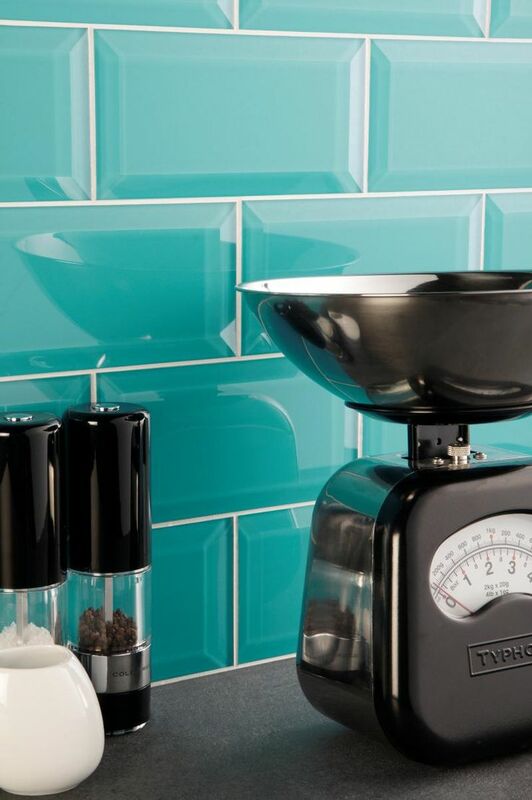 But these glass subway tiles are KILLER.